On Saturday 17th and Sunday 18th February, it will be your very last chance to see the Imagining the Divine exhibition. On its final weekend, the curators of both Imagining the Divine and Those Who Follow (Dominic and Stefanie) will be running two final open days. Attendees will see both exhibitions for free, enjoy a free lunch with the curators, and have the chance to take part in the ongoing research of the Empires of Faith project. These events are free to attend. We will start in the Ioannou centre on St. Giles, Oxford, with a brief survey, and then free entry to Imagining the Divine, where the curators will be on hand to answer any questions. Lunch will be provided in the Ioannou Centre, where attendees will also see Those Who Follow with the curators. In the afternoon we’ll talk about some of the themes of both exhibitions, from the ancient foundations of religious art, to modern perceptions of religious diversity in Oxford, in an open and informal environment. As well as being a great way to see the exhibitions, these days are a chance to be involved with research currently being undertaken at the University of Oxford on art and religion. The days are designed as an inspiring and entertaining experience for everyone. We’re keen to hear your thoughts on the exhibitions, on what religious art and buildings mean to you, and how you think about those of different religions and cultures. See below for further details on how to participate, the structure of the day, accessibility, and the research, and the Information Sheet for participants. All are welcome, no matter what background or level of engagement you might have with the religions, objects or buildings on display. 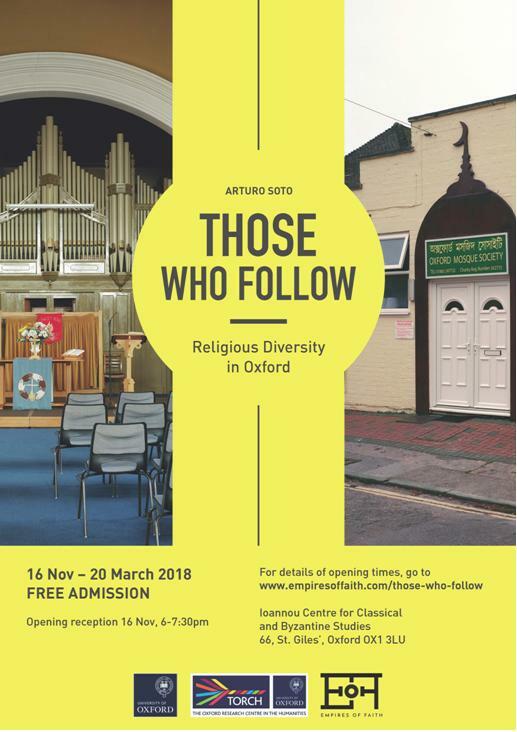 Members of Oxford’s various faith communities are particularly welcome to come and share with others their experiences of the spaces in and around the city. If you are interested in attending, SIGN-UP HERE for ONE of the days. The workshops are limited to 20 people. We would ask that if you cannot make it on the day, that you let us know as soon as possible so that we can make the space available. Both of the exhibition spaces are wheelchair accessible, and parking is available just outside of the Ioannou centre on St. Giles. If you have any particular requirements then please get in touch with dominic.dalglish@wolfson.ox.ac.uk, and we will do our best to accommodate you in any way that we can. Families with children are welcome to attend. Note that children will be welcome in the exhibitions, but will not be a part of the research and their details will not be recorded. A supervised space for children will be provided during workshop discussions on all of the workshop dates. If you have any queries, then please don’t hesitate to get in touch. At the start and end of each workshop day, we will ask participants to fill in two short questionnaires about their backgrounds (including religion), and about their experience both of the exhibitions, and religious spaces more generally. With your consent, we will be recording (audio) discussions as they happen. Participants will be asked to provide their name and their religious affiliation. This information will be confidential. Consent forms will be provided on the day, and there will be an opportunity to ask the organisers any questions that you might have. At no stage will participants be required to provide their name, religious affiliation or any other personal details in group discussions, but we will not discourage participants from doing so if they wish to. All of the details and information recorded on participants will be stored securely, and used to further the research of researchers at the University of Oxford, and to improve the provisions of the University and Ashmolean Museum for the general public. If you would like to know more about the research objectives, then please get in touch and we would be happy to discuss them further. If you have any queries or would like to know more about the exhibitions, the research, or the format of the workshops, then please contact dominic.dalglish@wolfson.ox.ac.uk.